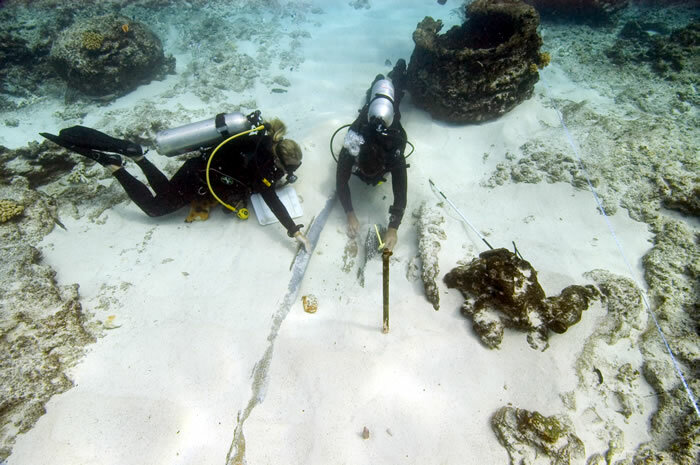 Kelly Gleason and Hans Van Tilburg document timbers hidden beneath the sand at the Pearl shipwreck site. Credit: NOAA/Schwemmer. 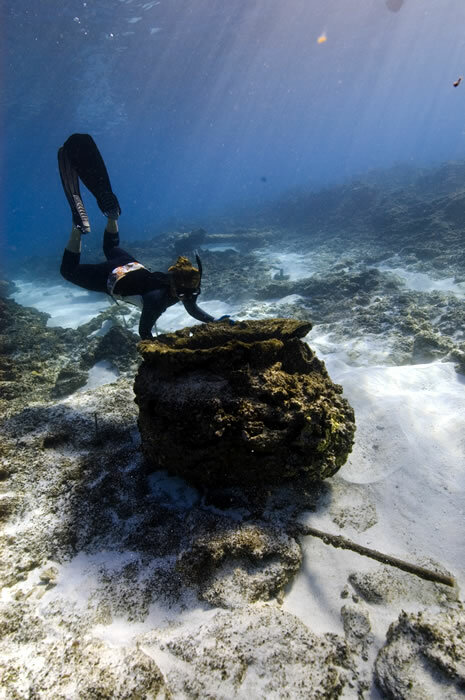 The shipwreck site believed to be the whaling ship Pearl, for which the atoll Pearl and Hermes Atoll was named, was discovered by NOAA divers in 2004. 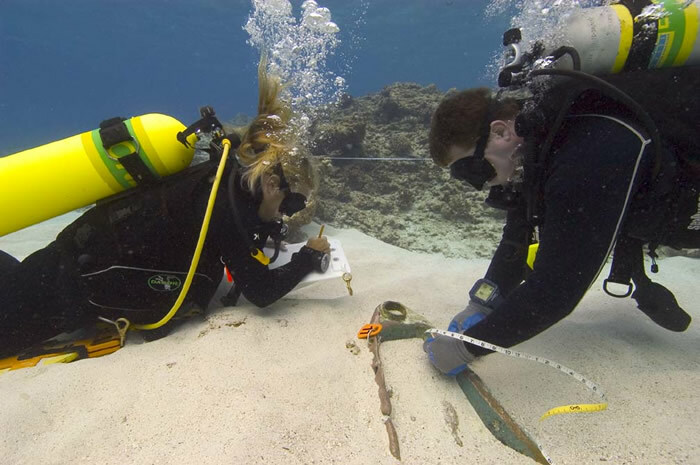 The Coral Reef Ecosystem Division of NOAA's Pacific Island Fisheries Science Center has supported the removal of drift fishing nets from the fragile reefs of the Northwestern Hawaiian Islands for a number of years. Annually, teams of "marine debris" divers visually survey high-impact zones in the distant atolls, cutting these nets away and removing them. 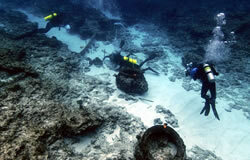 The wreck sites of the whalers Pearl and Hermes were discovered during one of the net removal missions. Preliminary archival work on the history of the British whaler Pearl indicates that the vessel was originally built as an American ship in Philadelphia at least as early as 1805. At some time after that, the ship may have been captured by the French during the aftermath of the Quasi-war and renamed La Perla. She was subsequently taken by the British privateer Mayflower and from there put into service in the British South Seas whaling industry out of London. As a British whaler, the Pearl (Captain Clark), sailing with her consort whaler Hermes, struck an unknown reef on the night of April 24th, 1822. The two ships had been making a passage from Honolulu to the newly discovered Japan Grounds, a track which took them through the uncharted Northwestern Hawaiian Islands. The combined crews made it safely to one of the small islands, salvaging provisions and timbers for the construction of the 30-ton schooner. However, before launching the beach-built rescue vessel Deliverance, the ship Earl of Morby was sighted. The castaways were rescued. Twelve of the sailors, including chief carpenter James Robinson, elected to purchase and sail the Deliverance back to Honolulu themselves. James Robinson later started the first shipyard at Honolulu in 1827. 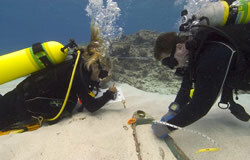 Kelly Gleason and Tane Casserley document a gudgeon at the British whaling shipwreck Pearl. Documentation of the Pearl site provides a glimpse of this wrecking event and the very early whaling technology in the Pacific. The Pearl and the Hermes (wrecked to the west of the Pearl) are the only known British South Sea whaling wreck sites in the world. Individual artifacts at this high energy site are quite deteriorated, but their distribution and superposition (vertical order) provide some of the site interpretation. The oak keel ground into the shallow sand channel, and distorted copper hull sheathing pieces pressed into the adjacent coral substrate, delineate the resting place of the ship. 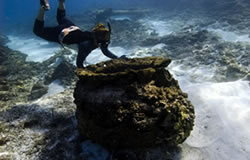 Large copper fasteners have been caught in depressions in the reef or still emerge vertically from the wooden keel. Four large iron try pots, fallen through the decks, now trap sections of hull sheathing, indicating that they fell through the ship as it deteriorated, the vessel falling apart where it initially grounded. These pots once rendered the whale blubber into oil. Anchors(not deployed) pinpoint the bow of the vessel towards the reef, gudgeon, or sternpost hardware near what was the stern to seaward. Inshore, a large anchor was set, possibly to hold the stricken vessel in place after the wrecking. Two cannon lie on the main site, indicating the nature of hazards faced during early 19th century whaling voyages to the Pacific. Ballast and fasteners and bricks are strewn about as well. Much of the iron and sheathing artifacts are literally embedded in the calcareous algae, fixed firmly in place. John Brooks films Tane Casserley, Kelly Gleason and Hans Van Tilburg documenting the Pearl shipwreck site. Site environment is challenging to any type of survey work. 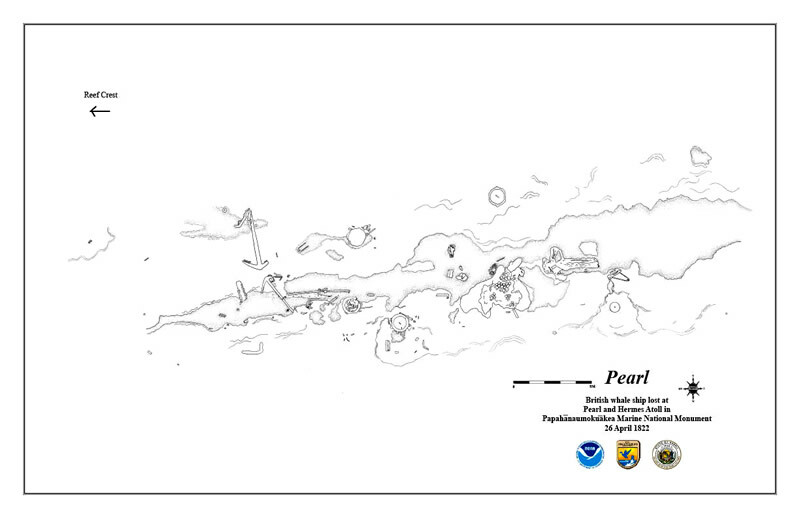 The wreck of the Pearl lies seaward of the reef crest, but in the proximity of the surf zone. At the northern end of the site the seafloor grows shallow (12 feet) and wave action can render this end unworkable, while divers at the southern end of the site are slightly deeper and more able to continue survey. 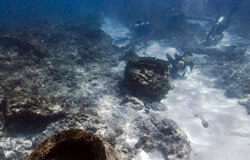 Just to the east of the site is a high shoal area (spur) of reef substrate, which breaks frequently. Dive boats must "live boat" in order to remain safely in the shoulder of the breakers and avoid occasional large sets which roll over the site. Divers on the site can expect 10-15 feet of horizontal surge on the bottom, and breakers rolling over their heads. There is minimal coral cover. The site is only accessible during good weather. A view of the sand channel where the British whaling ship Pearl wrecked. Credit: NOAA/Casserley. 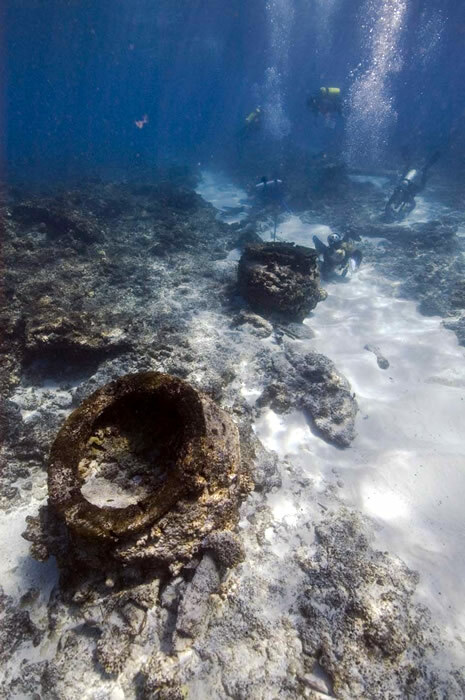 In June of 2005, a team of five maritime archaeologists with the National Oceanic and Atmospheric Administration (NOAA) Maritime Heritage Program sailed to the Northwestern Hawaiian Islands aboard the NOAA research vessel Hiʻialakai in order to extensively document shipwrecks and maritime heritage resources during a 25-day voyage. 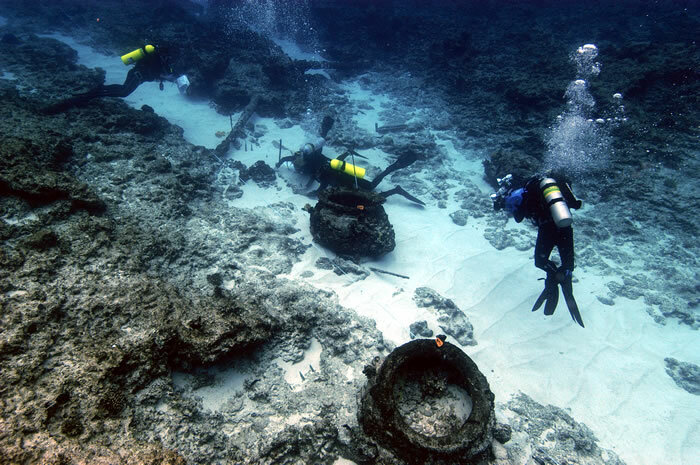 Time at the whaling wrecks discovered at Pearl and Hermes Atoll was a high priority for the archaeology team. 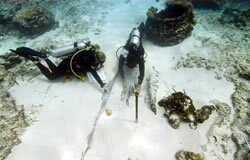 Fixed baselines were established at two artifact concentration sites and maritime archaeologists then collected photo documentation and data for a plan view drawing of the wreckage. Numerous previously undiscovered artifacts such as additional fasteners, tools, ship timber, hardware, anchors, trypots (cauldrons for rendering the whale oil), and portions of the tryworks (structures built to house the trypots) were added to the site inventory. 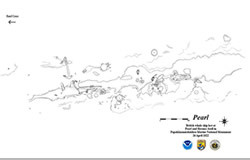 In 2006, a team of NOAA maritime archaeologists returned to the site and collected the data necessary to finish a site plan. Efforts to interpret the story of the British whalers Pearl and Hermes are ongoing. Hoku Johnson peers inside of a try pot at the British whaling ship Pearl. Credit: NOAA/Casserley. Site plan of the Pearl shipwreck completed in 2006.